Recently, I threw a fun egg themed brunch where I focused on creating recipes that use nutritious Eggland’s Best eggs. I thought I would share just one of the dishes that I served to my guests. 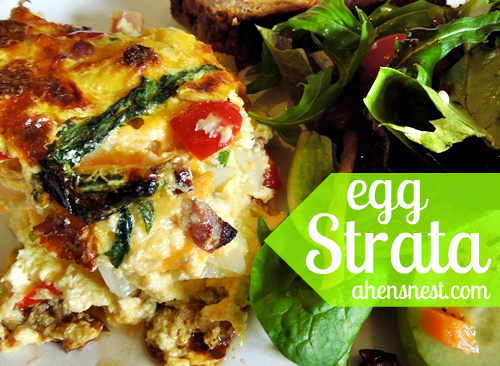 Now for the frittata… or is it a strata? I failed at photo taking with this recipe but I swear it tastes better than it looks! 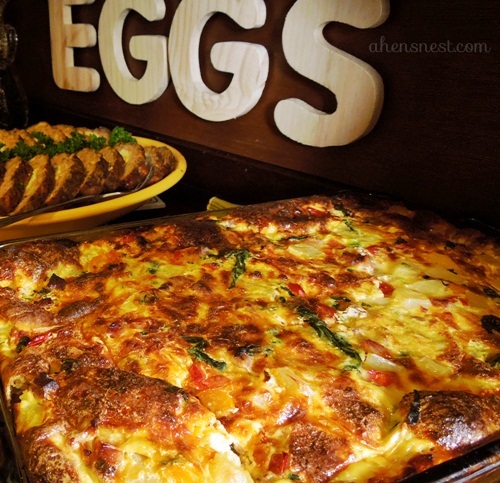 This delicious egg strata is full of ham and vegetables and is big enough to feed a crowd! Spray 9x13" baking dish with non-stick olive oil spray. In a medium bowl, whisk together the eggs, half-and-half, salt and pepper, set aside. In another medium bowl, lightly toss together the ham, peppers, green onion, spinach and cheese. Tear bread into small pieces, removing any hard crusts. Into prepared pan, layer half of the torn bread. Evenly distribute half of the ham mixture over the bread. Add half the bag of potatoes. Repeat layers with remaining ingredients. Place baking dish onto an aluminum foil lined baking sheet, to catch any spills. Slowly pour the egg mixture over top of the layered ingredients. Cover with aluminum foil and place in the refrigerator overnight. In the morning, take the prepared strata out of the refrigerator an hour before putting into the oven, to come to room temperature. Preheat oven to 350 degrees. Place strata in preheated oven and bake for 55 - 65 minutes or until center is just set. 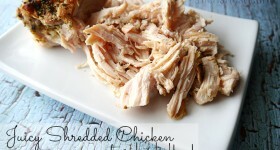 Turn on broiler and broil for 2 - 5 minutes, until top is golden and dish is puffed. Let set five minutes before cutting to serve. Also, I'm sure you could bake this the same day, just leave it sit for half&nbsp;an hour or so to let the bread soak up some of the liquid. Product information, VIP coupons, promotional item, giveaway prize pack were provided by Eggland’s Best, all thoughts an opinions are genuine and 100% my own. I gotta try that out sometime. The potato cheese looks so yummy. Thanks a lot for sharing the recipe. We like strata and fritata so I bet this would be a hit at our house. I love the strata I have to make it for I know my family will surely love it. Previous Post: Today Only – FREE Bracelet when you join + Avani Dead Sea Beauty Products Over 90% off!